Our Krav Maga Alliance; Israeli Krav International (IKI) has grown to include American and Israeli instructors and schools. Many of our instructors and affiliates are combat veterans, or police officers. I look forward to training together, learning from each other, and enhancing our knowledge. We are allies, we are working towards the same goal; personal safety, survival, self preservation. I have two flags in my home; Israeli and American. I see our two histories intertwined. Jews were America at the very beginning, helping finance the Revolutionary and fighting the battles. The ancient Hebrew was also there spiritually; many early Americans had Hebrew Biblical news. Just read any account of the early battles and you will come across one Hebrew name after another. The ancient Israelites also served as an inspiration for the early Americans, fighting for freedom against their oppressors. Our two nations share a common vision, and in many ways, a common faith. Common values unite us against those who wish to destroy our way of life. We must work together. Like many of us, I shall never forget where I was when I heard the news of the attack on the Twins Towers. Within two weeks I was in the USA standing as close to the ruins as I could get; the police were still there. I saw the smoke; two weeks had passed and the place was still in smoke. I walked around the City and saw the posters with pictures of missing loved ones and the ad hoc memorials set up for those who fell victim to this crime of hate. How tragically ironic; the Statue of Liberty, which for centuries has beckoned the poor and unfortunate to come to the shores of the United States, stood over looking, 'watching', as our enemies took advantage of American kindness and generosity and came to these shores with hate. The smoke coming up to the heavens reminded me of the smoke from the crematoriums at Auschwitz, where Jews and others were murdered and then burnt – for the crime of being 'different.' 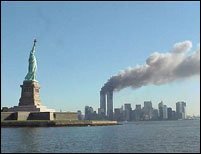 America embraces the 'different', and yet these people came to its friendly skies and turned the World Trade Center into a crematorium. When Americans come to Israel to train in Krav Maga, when this cultural exchange of survival knowledge takes place, I feel it is our way of standing united against tyranny. That is what the American founding fathers did, that is what we are all doing today.